Great Britain issues the Balfour Declaration, which supports the establishment of a Jewish homeland in Palestine. The Bolsheviks (communists) take power in Russia through revolution. After years of civil war and foreign intervention, the communists consolidate power under V. I. Lenin, who creates the Union of Soviet Socialist Republics (USSR.). The republics include Armenia, Azerbaijan, Belorussia, Estonia, Georgia, Kazakhstan, Kirghizia, Latvia, Lithuania, Moldavia, Russia, Tadzhikistan, Turkmenistan, Ukraine, and Uzbekistan. November 11: With the signing of an armistice, World War I ends in victory for the Allies (including the United States, Great Britain, France, and Italy) over Germany. The war claims 37 million casualties and 9 million dead. With the end of World War I, Great Britain gains control of much of the Middle East. Its goal is to secure ownership of the Suez Canal and protect its trade routes in the region. In Germany, the Weimar Republic replaces the wartime government and tries to implement a democratic government. It struggles with political extremes, economic problems, and general disorder. June: The Treaty of Versailles divides up German territory among the victors and Germany's neighbors in order to weaken it and prevent future aggression. The treaty also calls for substantial reparations from Germany. January: The League of Nations (a precursor to the post-World War II United Nations) is formed to enforce the treaties that ended World War I. The United States does not join, leaving the war-weakened nations of Europe with enforcement responsibilities. League of Nations grants Britain the "mandate" for Palestine, meaning it would have authority for the area, and charges it with "Jewish immigration and resettlement" there. October: Benito Mussolini, leader of the Italian Fascist Party, seizes power in Italy and runs the country using authoritarian power and right-wing policies. Adolf Hitler, leader of the National Socialist German Workers (Nazi) Party, attempts a coup in Munich, known as the Beer Hall Putsch, which results in his imprisonment. He writes Mein Kampf (My Struggle) while in prison, in which he calls for restoring German greatness through overthrowing the Weimar Republic and defying the Versailles Treaty. He also refers to Jews as a subhuman race of people and calls for their removal from Germany. January: Soviet leader V. I. Lenin dies. Communist Party secretary-general Joseph Stalin begins to consolidate his power by removing opposition within the party and national leadership. In the Treaty of Locarno, Germany recognizes its borders with France and Belgium and the demilitarization of the Rhineland. After Hitler's release from prison, he rebuilds the Nazi Party, establishing himself as sole leader to whom party members owe loyalty. The party structure includes the SA (storm troopers), a paramilitary arm; the SS, an elite group within the SA; the Hitler Youth; and other elements. German military hero Paul von Hindenburg is elected president, which stabilizes the country. December: Japanese emperor Yoshihito dies and is succeeded by his son Hirohito. 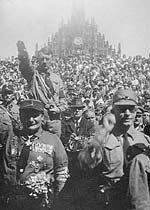 Hitler at Nazi party rally, Nuremberg, Germany, circa 1928. May: After faring poorly in Reichstag (parliamentary) elections, the Nazi Party focuses on building rural and small-town support, using antisemitic propaganda. Joseph Stalin begins his attempt to rebuild the Soviet economy and industry through collective farms and industrial improvements. Industry improves, but millions of Russian peasants (as many as ten million) die as a result of Stalin's policies. Soviet advancements raise fears in the West of communist expansion. In Europe throughout the 1920s, unemployment is high, currencies lose value, and major debt crushes national economies. The October 1929 stock market crash in the United States launches the worldwide Great Depression. Nations react to the crisis differently. The U.S. government, under President Franklin Delano Roosevelt, intervenes actively in the economy. In Europe, more conservative governments rule, restricting wages and government spending. The Great Depression essentially ends in 1939 with the beginning of World War II and the mobilization of national economies for war. In Germany, the Weimar government, led by a coalition of left-wing and conservative parties, collapses trying to deal with economic problems. President Hindenburg invokes emergency powers that place authority in a chancellor and the cabinet. September: After the first chancellor fails to unify the German government, new elections are held. The Nazi Party wins 18 percent of the vote, becoming the second largest party in parliament. At the Lausanne Conference, Germany, Britain, and France agree to suspend reparation payments required by the Versailles Treaty. July: German president Hindenburg reluctantly runs for re-election, fearing Hitler's election if he does not. Hindenburg wins the election, but Hitler gets 37 percent of the vote, making the Nazi Party the largest party in the parliament. General instability continues with the 400,000-strong SA committing street violence. November: Franklin Delano Roosevelt is elected president of the United States. January: President Hindenburg names Hitler chancellor of Germany. February: Nazi storm troopers and police establish the first concentration camps to hold political opponents. Dachau opens in March and is the only camp to remain in operation from the earliest days of the Third Reich until its demise in 1945. February: The German Reichstag (parliament) building burns. The Nazis claim that communists set the fire and use it as a pretext to take police-state powers. Soon, parliament grants Hitler authority to issue laws without parliamentary action. April: The Nazis issue a decree ordering compulsory retirement of non-Aryans from civil service. Hitler calls for a boycott against Jewish businesses. These actions, as well as Nazi attacks on Jews, cause many Jews to begin emigrating from Germany. Germany and Poland sign a nonaggression treaty. In the Night of the Long Knives, Hitler arrests leaders of the Nazi SA and has them killed by the SS, in order to earn support of the German Army, which opposed the SA. SS power grows in response. August: German president Hindenburg dies. Hitler declares himself Führer (leader). 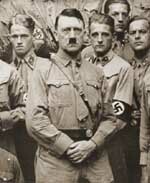 As leader of the German Army, Hitler requires officers and soldiers to swear allegiance to him. Documentary film Triumph of the Will released. March: Hitler defies the League of Nations and Versailles Treaty by reintroducing a military draft. September: Nuremburg Laws deprive Jews of civil rights and prohibit marriage between Jews and nonJews. Only so-called racial Germans are entitled to civil and political rights. Jews are defined not by their religion but by their ancestry: If a person has three Jewish grandparents, he or she is considered Jewish for purposes of classification. A new wave of Jewish emigration from Germany begins. March: Hitler defies the Treaty of Locarno by sending troops to occupy the demilitarized Rhineland. July: A coalition of Spanish conservatives and army officers (known as the Nationalists) launch a coup in Spanish Morocco, then invade Spain hoping to wrest control from the leftist government of the Spanish Republic. Germany and Italy support the Nationalist forces, testing some battle techniques they will use in the coming world war. The Soviet Union supports Republican forces; other major powers stay neutral. In April 1939 the Nationalist forces prevail. August: The Olympic Games take place in Berlin. October: Italy and Germany sign the Rome-Berlin Axis Pact. November: Japan and Germany sign the Anti-Comintern Pact. December: Chinese nationalist and communist forces join to fight against Japan. Neville Chamberlain becomes prime minister of Britain. He initiates a policy known as appeasement to negotiate with Hitler concerning his demands for greater German sovereignty and territory. After years of Arab-Jewish tension, Britain proposes a three-way division of Palestine in which the Jews, Arabs, and British would each have their own territory. Arabs reject this proposal. July: Japan and China go to war. March 13: The German Army marches into Austria and the formal union (Anschluss) of Austria and Germany takes place. Jews are almost immediately singled out for discrimination. July: At a conference in Evian, France, delegates from 32 countries, including the United States, Great Britain, France, and Canada, consider how to deal with Jewish refugees from Nazi Germany but refuse to accept more refugees. September: The Munich Agreement among Germany, Great Britain, Italy, and France allows Germany to annex the Sudetenland from Czechoslovakia in exchange for Hitler's pledge of peace. Czechoslovakia does not take part in the negotiations. 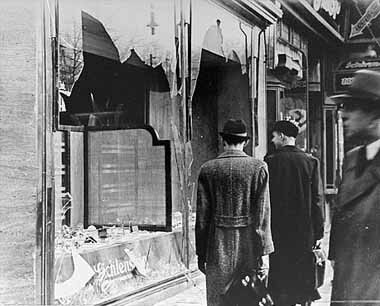 November 9-10: Kristallnacht: Nazi-orchestrated pogrom against German Jews. Thousands of synagogues and Jewish businesses are looted and destroyed as police and firefighters stand by. The Nazis blame Jews for Kristallnacht, require them to clean up after the attacks, impose fines of $400 million on the Jewish community, and prevent business owners from collecting insurance payments. The state confiscates Jewish businesses and expels Jewish children from schools. The Anschluss (annexation of Austria by Germany in March) and Kristallnacht spur more Jewish emigration. More than 400,000 Jews leave Germany between 1933 and 1940.